Cowgirl Jewelry & Western Accessories! look good in the saddle!" rustic metal items by Ataggirl Creations! ENTIRE LINE of Ataggirl Jewelry! 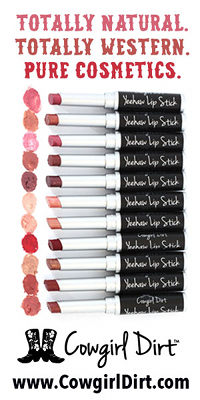 Non-Allergenic and Gluten free: perfect for roseacea, acne-prone, and sensitive skin. Sun Resistant: contains ingredients with natural properties to protect your skin from both UVA and UVB rays. Anti-Inflammatory: contains ingredients that calm irritated and sensitive skin. Concentrated: only small amounts of products are needed for beautiful results. Natural: contains no toxic chemical, artificial preservative, dyes, nano particles, talc, or parabens. Organic: contains the highest quality organic oils and extracts. Samples available for only 99 cents! CLICK ON PICTURE TO VIEW AND ORDER! Custom Jewelry orders taken with deposit and balance due at completion. Brides and bridesmaids sets made to Bride's specifications. Check out "SOLD Items" for possible remakes that will be similar to originals. Contact Melissa at melissa@buckaroobay.com to order your custom made Buckaroo Bay Original! We carry several "Proudly hand-made in the USA" items! Take a look at Shellie Laabs Cowgirl Flair for some gorgeous pieces! Check out the beautiful Rustic Metal Jewelry by Ataggirl Creations! Get your BLING ON with a piece of cowgirl jewelry by Bling Dreams! by Go Girly or Go Home! "Get your BLING BLING for the show ring at Buckaroo Bay!" Buckaroo Bay is proud to annouce that some of our items were featured in the very first issue of a NEW publication by the American Paint Horse Association. Please check out FLASH Magazine! "Shine On" to see Buckaroo Bay featured items. Also, as seen in Cowgirls In Style Magazine! Cowgirls or Cowgirls at Heart check out our funky chunky fun fabulous Western necklaces, bracelets, earrings, rings and magnetic pendants with plenty of bling! Turquoise, Coral, Australian Crystals, Zebra, Leopard and Tiger perfect for any Cowgirl who loves Western Cowgirl Jewelry! Crosses, Pistols, Wings and Fleur De Lis! Mossy Camo, Horseshoes and Horses! Rodeo to every day WesternCcowgirl flair! Hair on Hide designs that all good Cowgirls love. Western Cowgirl Jewelry from wild to tame we have it! Pick the Cowgirl Jewelry style that fits your personality! Western Accessories from blinged out flip flops that make your hooves sparkle from Montana West, Hide N Sole, Soul West, Rustic Bling Bling and Isadella to super trendy Mossy Camo Purses and blinged out Western handbags from Montana West some have matching wallets. Sunglasses with western flair and lots of rhinestone dazzle. For Rodeo Cowgirls, Divas and any other gal who wants to strut their stuff and look good in their Western Cowgirl Jewelry! Check out Jewelry Designer Shellie Laabs for some beautiful, one of a kind cowgirl jewelry. We have vintage inspired Go Girly T shirts and Go Girly hats which are bedazzled with real Swarovski Crystals for the shine factor! Get your COWGIRL JEWELRY at Buckaroo Bay for Cowgirls! A girl can never have enough bling or enough Western Cowgirl Jewelry! "Boots and Bling, it's a COWGIRL Thing!" LOCAL GALS: Host a Buckaroo Bay Home Party and earn Buckaroo Bay Bucks! Turn those Buckaroo Bay Bucks into cash for anything on the website! 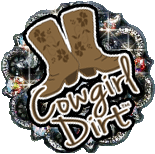 A great way to get those items of Cowgirl Jewelry you want! BOOK A PARTY TODAY AND GET YOUR COWGIRL ON! Ask about our Fund Raisers. Earn money for your special project. Great for 4-H groups! We tailor the fund raiser to fit your group's needs! "She's strong willed and independant. She's as beautiful inside as she is outside. She will never take no for an answer. When she is told she can't do it because she is a girl, she will prove you wrong every time. She loves the thrill of the ride and the romance of adventure. She's you and she's me. But most of all she just is! Long live the Iron Cowgirl!" "A cowgirl is a woman with guts and a horse!" "Cowgirl is an attitude, really; a pioneer spirit, a special American brand of courage. The cowgirl faces life head on, lives by her own lights and makes no excuses. Cowgirls take stands. They speak up. They defend the things they hold dear. A cowgirl might be a rancher or a barrel racer or a bull rider or an actress. But she is just as likely to be a checker at the local Winn Dixie, a fulltime mother, a banker, an attorney or an astronaut." "The Cowgirl faces life head on, lives by her own rights and makes no excuses." Tell me it can't be done and I will do it. Tell me the goal is too high and I will reach it. Place an obstical in front of me and I will soar over it. Challenge me, dare me or even defy me.